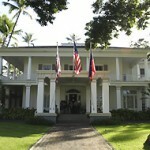 The word “Ennichi” is made up of “en” (having a special tie/relation) and “nichi” (day). Also referred to as Saint’s Day, Ennichi is a special day when Japanese people celebrate the birth or the passing of the deity that they worship. 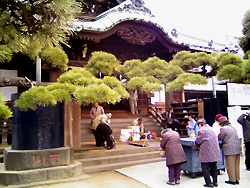 On Ennichi, people visit temples or shrines to pray to their deity to bring them good fortune and health. 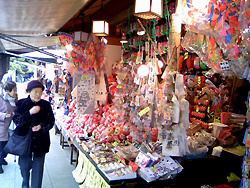 Streets around the temple or shrine are filled with food vendors and game stalls, attracting the young and the old alike. Some of the popular food items sold at Ennichi are: Takoyaki (ball-shaped flour batter filled with diced octopus), Okonomiyaki (Japanese savory pancake), Yakimorokoshi (grilled corn on the cob), Kakigori (shaved ice) and cotton candy. Other activities you can enjoy at Ennichi include playing Kingyo-sukui (goldfish scooping), and buying Omen (plastic masks often featuring popular cartoon characters) and water balloons. 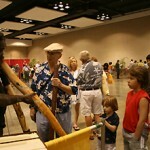 We first recreated Ennichi at our 14th Honolulu Festival (2008), and since then it has become one of our most popular events. 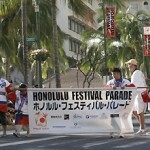 At Honolulu Festival’s Ennichi corner, you can experience authentic Japanese Ennichi activities such as fish-scooping, yukata dressing, origami and plastic mask making. 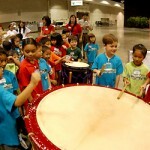 Ennichi, one of Japan’s traditional events, remains very popular regardless of generation. 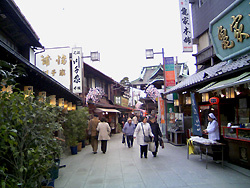 The continuance of this tradition owes to the lifestyle of people in Tokyo living in an area known as “Shitamachi“, which translates as “low town” or “downtown”. Shitamachi was created during the Edo period, and it referred to all the districts lower than Edo Castle (today’s Imperial Palace). Shitamachi today is a collective term for areas such as Asakusa, Ueno, Kanda, Nihombashi, Kyobashi, Fukagawa, Ryogoku and Shibamata. It preserves the Tokyo of the past, filled with tiny streets, traditional-style houses, neighborhood stores, temples and shrines. 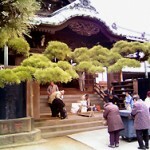 Shitamachi is a place where people live a simple lifestyle and take care of each other within their close-knit community. Tora-san is the protagonist of a series of Japanese films called “Otoko wa Tsurai yo” (It’s Hard Being a Man). 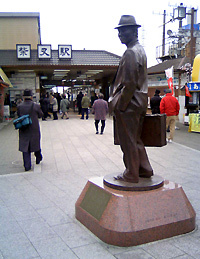 The films depict the life of Tora-san, a man from a part of Shitamachi called Shibamata, Tokyo, and gained a wide popularity in Japan from the 60s to the 90s. As a wandering peddler who loves drinking and pretty women, his irresponsible yet unique lifestyle fascinated Japanese audience. The main character, Tora-san, was played by an actor Kiyoshi Atsumi, who starred in a total of 48 films. 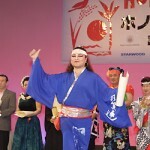 The Guiness Book of Records has recognized the Tora-san films as the world’s longest-running film series with the same actor playing the title role. Tora-san travels around aimlessly, never wanting to linger at one place. No matter what happens on his journey, he will always return to the humble sweet shop run by his uncle, auntie and sister in Shibamata, a small Tokyo town where he grew up. In Shibamata, neighbors are like extended family members and everyone knows each other. Tora-san’s friends and family in Shibamata are also loyal and hard-working, which reminds us of common Japanese people in a simpler time, even though the films are located in contemporary Japan. Those characters surrounding Tora-san are also an appeal of the films, and although each film has a similar story line, audience never gets tired of it. Now that it has become clear what “Ennichi”, “Shitamachi” and “Tora-san” mean, let us explain the relationship between these terms. As a peddler from Shitamachi, Tora-san wanders all over Japan and sells his products at Ennichi for a living. Peddlers like him are called “Tekiya”, and there are still a number of Tekiya throughout Japan. 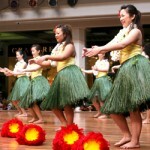 We believe that they make an important element of Japanese Ennichi culture, and we would like to appreciate them by recreating Ennichi and its unique atmosphere here in Hawaii.